As my older son prepared for junior kindergarten, my partner and I consulted our lesbian parenting books and dutifully made an appointment with his teacher to discuss the fact that Rowan Has Two Mommies. We weren’t sure what to expect. 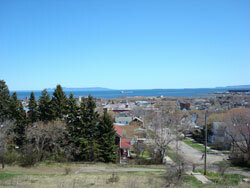 We live in Thunder Bay, Ontario, a city of approximately 115,000 people on the north shore of Lake Superior. It’s the biggest thing going in northern Ontario, but it feels like a small place to us. The city of Thunder Bay, Ontario, is very pretty. Photo: Flickr/MaryLynn. Since we moved here from Toronto, Canada’s largest city, four years ago, we haven’t personally encountered anything in the way of homophobia, but we didn’t want to leave to chance that it could crop up in our children’s classrooms. So, on a late August day we visited the school and sat down on preschool-sized stools with Rowan’s teacher and had The Talk. As we started to wrap up the conversation, I mentioned in passing that Rowan was Jewish, and that it would be important to ensure that his culture and religious traditions were reflected in the curriculum. In Thunder Bay, it appears, being queer, even being a queer parent, is no big deal. But being Jewish? People aren’t so prepared for that. Thunder Bay used to boast two synagogues, one on each side of town. Now there’s just one, with beautiful stained glass windows but no rabbi, run by a small but dedicated membership (many of them who are not Jewish) whose mission–and it’s a challenging one–is, essentially, its survival. While I have many issues with the Conservative and Zionist traditions I was raised in, at least I have a background and a context from which to question those traditions. My sons may have those, but they will be much more difficult to acquire in Thunder Bay. In the meantime, Rachel and I are left to raise our sons as Jews according to the resources available to us. We travel to Toronto for the festivals of Hanukkah and Passover, teach our sons the Four Questions traditionally asked by the youngest child at the Passover Seder. Each Friday night, we say the blessings over Sabbath candles and hallah (I make it weekly because you can’t find it in local grocery stores). We post a mezuzah on our door that identifies us, at least to those in the know, as Jews, and are one of the few houses on the street not festooned in Christmas decorations each so-called “holiday season.” This past December, I went into Rowan’s classroom to talk to the kids about Hanukkah (my presentation was sandwiched between the carol service and the Santa Claus play), and I will do the same at Passover. We’re doing what we can. Even so, I sometimes resent the fact that this job has been thrust upon me. I always imagined that my children would grow up somewhere where they could just be Jewish, without having to work hard to maintain that identity. I never wanted to be a Jewish educator, and here I am: de facto Hebrew-school teacher. Perhaps ironically, I’d be much more comfortable going into a classroom to talk about what it means to have two moms or two dads. But no one here seems to need to talk about the “two moms” thing, least of all my kids. For them, having two mothers is natural, omnipresent, what they’ve always known–kind of like how I grew up Jewish in Toronto. Being Jewish here, on the other hand, requires a little more work, especially when everyone around us isn’t, and when the pull of Christmas and easy assimilation is so strong. What my kids need, and what I need for them, is a sense that it’s OK to be Jewish, that it’s possible to be Jewish, even in, perhaps especially in, Thunder Bay. Susan Goldberg is a writer, editor and blogger and is coeditor of the anthology And Baby Makes More: Known Donors, Queer Parents and Our Unexpected Families. She blogs at mamanongrata.com.